The Makita 18-Volt LXT Lithium-Ion Cordless Planer (model XPK01Z, tool only) combines the speed and capacity of a corded planer with the convenience of cordless. The result is fast and accurate stock removal, without the cord. This tool is part of Makita's expanding 18-Volt Lithium-Ion series, an extensive cordless tool line-up powered by an 18-Volt lithium-ion slide-style battery that offers an exceptionally fast charge time. For increased versatility, the tool can be powered by any Makita 18-Volt LXT and compact lithium-ion batteries displaying the star symbol. Includes socket wrench (782209-3), blade set (D-16966) and blade gauge (123062-2). 2-blade cutter head with double-edged carbide blades for superior performance and smooth finish. High power-to-weight ratio; weighs only 7.4 lbs. 14,000 RPM motor engineered for fast stock removal. Spring-loaded stand elevates the base to protect the blades and work piece. Precision machined aluminum base for planning accuracy. Ergonomically centered balance with rubberized soft grips on the front and rear handles for increased comfort. Easy blade setting system for fast blade installation. Electric brake ensures maximum productivity. Equipped with Star Protection Computer Controls to protect against overloading, over-discharging and overheating. Compatible with Makita 18-Volt lithium-ion batteries with a star symbol. Brand new in the box. The item "Makita XPK01Z 18V LXT Cordless Lithium-Ion 3-1/4 in. Planer (Tool Only) New" is in sale since Friday, March 1, 2019. 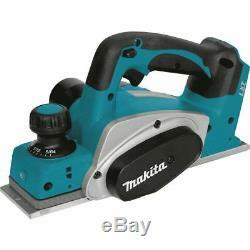 This item is in the category "Home & Garden\Tools & Workshop Equipment\Power Tools\Planers". The seller is "selenak1043" and is located in Fruitland Park, Florida. This item can be shipped worldwide.